It's sensational, just like the pendant, which was immortalised forever by Kate Winslett and Leonardo di Caprio in the blockbuster that was Titanic! This big, bold, OTT ring features a vibrant Blue Swaroski Crystal Heart shimmering with hidden depths of royal blue, turquoise and deep purple, as it sits on an adjustable band, surrounded by crystal clear Swarovski crystals, . 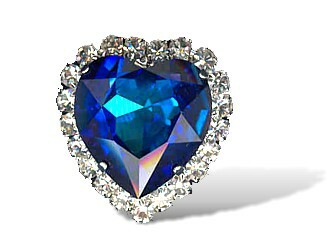 A perfectly magnificent copy of the famous blue diamond committed forever to the silent bed of the ocean. Eyes will pop, jaws will drop as it becomes a major talking point wherever you go. Heart: 4.5cm x 4cm. Adjustable.